The EMS standard exists and revised from time-to-time to help organizations minimize operations which negatively affect the environment and helps to comply with laws, regulations and requirements to continually improve. The ISO has revised ISO 14001 standard and released as ISO 14001:2015 in September 2015. During implementing Environment Management System as per ISO 14001:2015, any organization has to complete documentation process for registration. We offer readymade ISO 14001:2015 documentation kit, which is a complete set of editable documents that covers all the revised standard requirements. EMS 14001:2015 assists companies in reducing their environmental impact, and improvement in environmental performance. In revised ISO 14001:2015 requirements, at few places, the focus is on requirements of documented information. This documented information may be made as EMS manual, process flow charts, forms, exhibits, standard operating procedures, etc. Our EMS documents set can be a very effective tool to identify these cost-savings and time-savings opportunities for organizations in preparation of EMS certification documentation. Some other organizations can falter in its planning, lack senior management's commitment, and may have poor understanding of how it should be documented to meet EMS requirements. This globally used ISO 14001:2015 certification documentation kit covers sample copy of environment manual and clause-wise details for how environmental management systems are implementing. It includes list of procedures as well as overview of organization and covers tier-one of EMS documents. These documents include manual, mandatory procedures as per environment management system covering all the details such as purpose, scope, responsibility, how procedure is followed, list of exhibits, reference documents and formats. The ISO 14001:2015 documents in English cover guidelines for establishing controls on significant aspects, work instructions for operators as well as standard operating procedures. Also included is sample copy of blank forms required to maintain records, establish control and make system in the organization. The samples are given as a guide to follow and organizations are free to change the same to suit their own requirements. In these editable sample documents more than 200 audit questions are included for preparing own internal audit checklists. What Editable Documentation Kit for EMS Certification Offers? EMS Manual - Environmental Manual (10 Chapters and 4 Annexes). Environment Management System Procedures (07 Mandatory Procedures). Blank sample formats for all the departments (41 sample formats). Templates of Environment Management Plans (06 filled EMPs). EMS 14001:2015 Compliance Matrix (01 excel file). The entire Environment Management System Documentation Kit with manual and more than 700 audit checklists is prepared in editable word format so it is very easy to edit them, which saves lot of time. Our more than 300 satisfied clients all over the world haved used its previous version and successfully implemented environment management system within their organization and successfully got certification. All of them, as well as new users, can purchase our product D103 - ISO 14001:2015 documentation kit, to upgrade their existing environmental management system or implement ISO 14001:2015 first time. Following are the key benefits of using our documentation kit to meet ISO 14001:2015 system requirements. By using these documents and EMS manual, you can save a lot of your precious time while preparing the EMS documents as per requirements. The documents take care for all the sections and sub-sections of ISO 14001:2015 requirements and help you in establishing a better system. Total documentation kit, including manual, enables you to change the contents and print as many copies as you need. The users can modify the documents as per their industry and create own documents for their organizations. Readymade templates, environmental manual and sample documents are provided which can reduce your time and cost of ISO 14001:2015 documentation preparation. The audit questions help in making perfect internal audit checklist. You will get better control in your system as our proven formats and templates are developed under the guidance of experts and globally proven consultants having rich experience of more than 20 years in system certification consultancy. Our products with manual are highly sold globally and used by many multinational companies. These products have provided total customer satisfaction as well as value for money. Our documentation kit has been verified and evaluated at various levels of our team and more than 1000 hours are spent in preparation of this ISO 14001:2015 documentation kit. 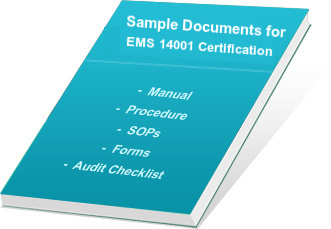 Our EMS documentation kit for ISO 14001:2015 is prepared by a globally proven team of leading consultants. Following are the links of partial documents and their DEMO, for users looking to purchase any of our low-priced environment system document set, separately. On successful completion of securred purchase, we provide user-name and password to download the product from our FTP server. We are provide instant on-line delivery of our products to users by sending user-name and password by e-mail. This ISO 14001:2015 Documentation Kit is available at very compatible rate and anyone can purchase it with secure transaction. We ship worldwide and our products are used in more than 90 countries.